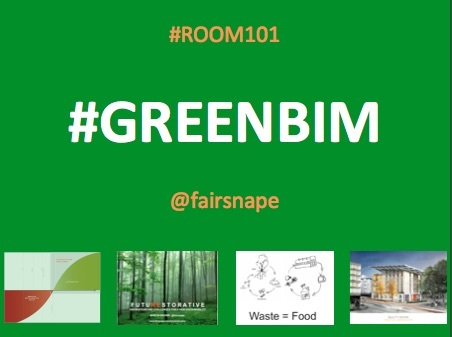 Why did I seek to put GreenBIM into Room 101? – microBEnet: the microbiology of the Built Environment network. home .PressForward, PF: Building Science Why did I seek to put GreenBIM into Room 101? BIM (and digital construction) is the most powerful of improvement and collaborative programmes for decades, if not in the history of construction — all BIM should be green — all BIM should be pushing the boundaries doing more good, not happy just to maintain a business as usual, a sustainability status quo or be incrementally less bad. Every BIM is a core enabler in achieving Construction Vision 2025 tough sustainability and carbon targets — requiring net positive approaches. Construction 2025 is not just for GreenBIM’s. One of the fast emerging sectors within the world of sustainability, with a predicted market value in the billions, is the circular economy — every BIM, not just GreenBIM’s should be addressing this concept. In particular, where one building becomes the food, the material farm, for the next building. Am I in danger of creating a new hashtag and meme here: #CEBIM _ Circular Economy BIM anyone? Green Vision has embraced Living Building Challenge — where for accredited projects like the Bullit Centre there are no energy performance gaps — this is what a BIM should achieve on every building, green or not, and fast. Lets seek a net-positive performance gap. This is Construction Vision 2025! Conclusion: My reason for putting GreenBIM into 101 is out of frustration than annoyance. We would all agree that all BIM’s should be green BIMs, so do we need another label, perhaps, perhaps not, but what we do need to do is to take the agenda from ‘GreenBIM’ sessions to all other BIM events, initiates, software, projects, and make every BIM Green. I also blogged on this very issue back in 2013 — Do we really need ‘Green BIM’? Source: Why did I seek to put GreenBIM into Room 101? Holly Bik is a Birmingham fellow at the University of Birmingham. I have no idea what this article is about. Could the author explain some of the acronyms and give some background? This was a test of a new content management system, it wasn’t from anyone at microBEnet.